Whether you’re a professional painter or a budding novice, setting up a painting studio in your home is a wonderful way to develop your skill and encourage more time with your hobby. Make your art space both functional and inspirational with these tips. You don’t need a large home to have a designated art studio. You simply need a specific corner you can devote to the task. Choose an area large enough to accommodate an easel and art cart, at a bare minimum. If you can set aside an entire room for this purpose, so much the better. Make sure you keep other items out of your art studio. Don’t let bills pile up on the desk or toys creep onto the floor. Be vigilant about keeping this area for one purpose only. 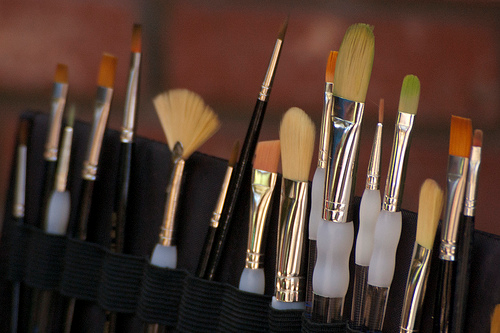 Organization is essential in your home painting studio. You don’t want to waste your time searching for the right brush or paint color when you’re feeling that invigorating spark of inspiration. Make sure your tools are always at the ready so you can get to work at a moment’s notice when you have a vision in your head. For paints, consider using a tiered spice shelf or layered cupcake stand to keep several colors visible at once. If you use small squeeze bottles, glue a magnet to the bottom of each and mount a metal tray to the underside of a cabinet. You can then hang the bottles upside down so the paint is always ready to flow. Stick paintbrushes in a planter filled with marbles or hang them from rows of hooks mounted to the wall. Keep it all neat so you always know where everything is. If you’re working in a stark, dreary space, you may find inspiration frustratingly elusive. Create a bright and beautiful area that entices your inner muse to come out and play. Fill your art studio with things that you love, whether these are vases of bright blossoms or sleek modern sculptures. Make this a place that invigorates and invites. Artwork prefers a stable climate with minimal fluctuations in temperature and humidity. If you’re storing finished pieces in your painting studio, you should make sure the temperature stays within a 20-degree range and humidity doesn’t vary more than 20 percent. Low humidity is best to keep your pieces safe and help new paintings dry in a reasonable amount of time. You can control the climate in your art studio independently from the rest of your house with HVAC zoning. This enables you to set different conditions for each zone of the house. You can keep your art studio cool and maintain a lower humidity level by running the air conditioner regularly there, while setting a higher temperature in the rest of the house. Your newly organized painting studio will give you everything you need to create masterpieces and store your art safely. All that’s left is to find some quiet time to create!